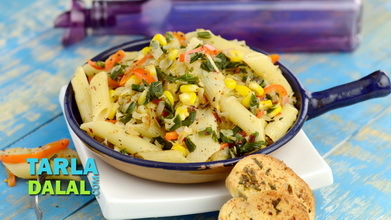 The Pasta and Vegetable Sizzler in Tomato Sauce is a treat not just to the taste buds, but to all the other senses too. In fact, the making of a sizzler is a pleasure to watch. If you have never watched it being prepared by the chef at a party, then this recipe is your chance to recreate the magic in your own kitchen. A line-up of veggies smartly categorized by their cooking time, are added one after the other to the sizzler plate to be sautéed in butter and positioned appropriately like actors performing on a stage. 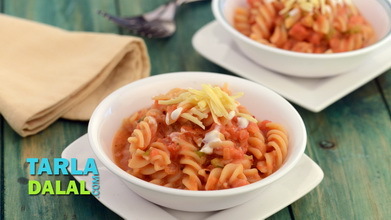 Then come the pasta and the tangy tomato sauce, to take the lead positions at the centre of the formation, all set to be devoured by a discerning diner! 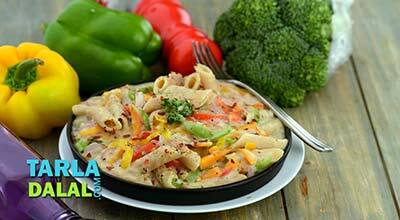 Heat a deep non-stick pan, add the tomatoes and cook on a medium flame for 10 minutes, while stirring occasionally. Allow the mixture to cool completely and once cooled, blend in a mixer to a smooth mixture and strain it using a strainer. Transfer the mixture into a broad non-stick pan, add the oregano, salt, chilli powder, sugar, olive oil and fresh cream, mix well and cook on a medium flame for 1 to 2 minutes, while stirring occasionally. Keep aside. Heat a sizzler plate over an high flame for atleast 8 to 10 minutes or till red hot. Put ½ tbsp of butter in the center of the plate, add the broccoli, salt and pepper and sauté on a high flame for 1 minute. Slide the broccoli around the circumference of the plate. Put ½ tbsp of butter in the center of the plate, add the babycorn and salt and pepper and sauté on a high flame for 1 minute. Slide the babycorn around the circumference of the plate. Put ½ tbsp of butter in the center of the plate, add the green peas and salt and pepper and sauté on a high flame for 1 minute. Slide the green peas around the circumference of the plate. 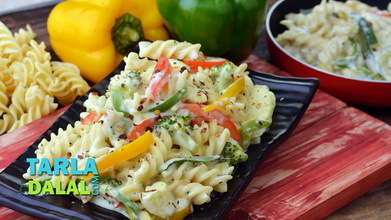 Put the remaining ¼ tbsp of butter in the center of the plate, add the coloured capsicum and salt and pepper and sauté on a high flame for 1 minute. Slide the coloured capsicum around the circumference of the plate. 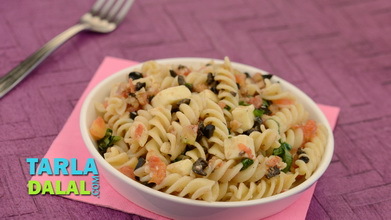 Finally place the pasta in the centre of the plate, pour the olive oil, salt and pepper, mix well and cook on a medium flame for 1 to 2 minutes, while stirring occasionally. 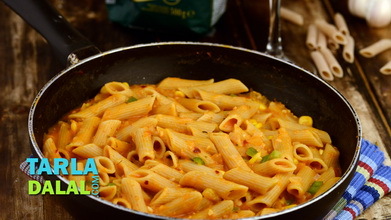 Add the prepared tomato sauce evenly over the pasta and cook on a medium flame for 1 to 2 minutes, while stirring occasionally. Add the fresh cream and cheese evenly over it.